With Some of the Best Scenery in the Southwest! Are you searching for scenic California boondocking outside of the usual Long Term Visitor Areas? We found plenty! 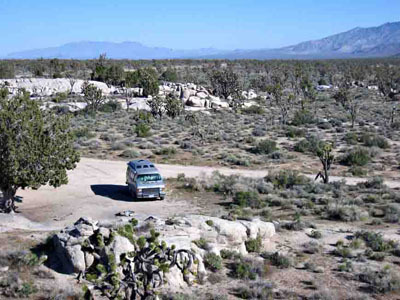 In fact, we documented nearly one hundred unique free camping locations in California's desert and Eastern Sierra regions. Most of them are accessible to any size RV and suitable for tents as well. These photos are just a few examples. What is your preference in a California boondocking location? Is your ideal free campsite in a pine forest? Or in a Joshua Tree forest? 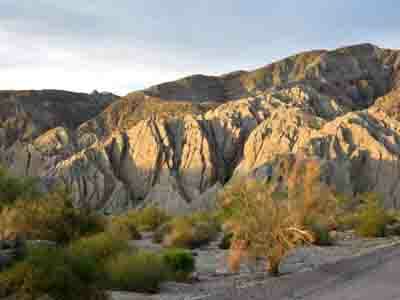 Do you prefer the jagged uplift at this free camping area on the San Andreas Fault? 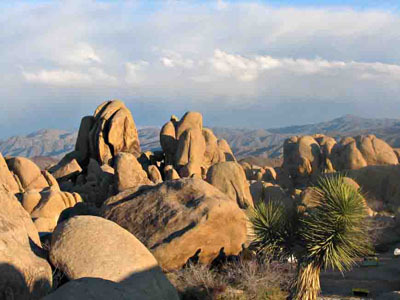 Or the weathered granite rocks in this Joshua Tree National Park campground? Could you sit for days soaking up the view in this idyllic free camping area? 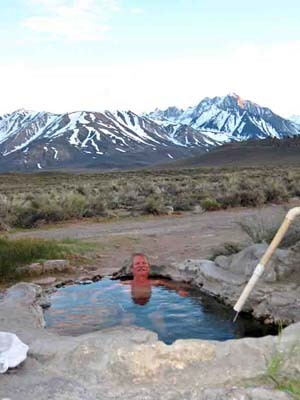 Or do you prefer a different kind of soaking in one of many free natural hot-springs? 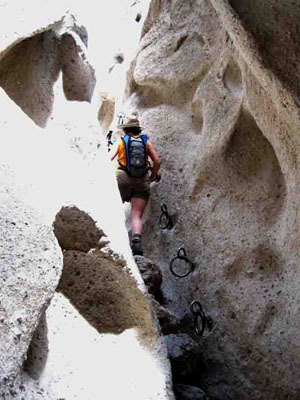 Will you spend your days hiking unique trails in the California desert? 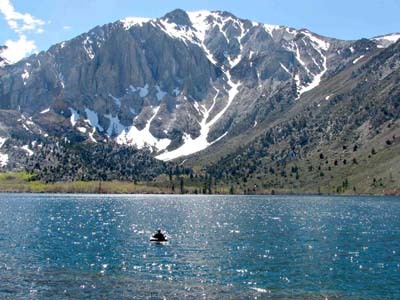 Or paddling on a pristine mountain lake on the eastern edge of the Sierra Nevada Mountains? 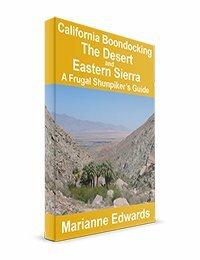 No matter what your preference, the The Frugal Shunpiker's Guide titled "California Boondocking: The Desert and Eastern Sierra" covers them all. 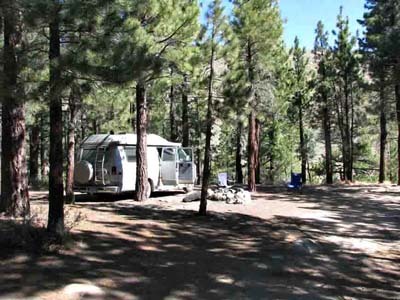 It provides precise, easy-to-follow directions to more than 140 frugal (mostly free) camping options that we've discovered throughout California's deserts and Eastern Sierra regions. 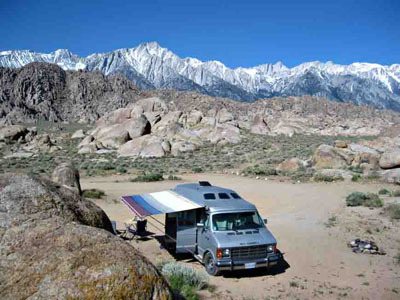 "California Boondocking: The Desert and Eastern Sierra - A Frugal Shunpiker's Guide"
This California boondocking guide covers eastern California from the Mexican border to Lake Tahoe. It suggests routes and camping along the Colorado River Valley, throughout California's deserts, and everything east of the Sierra Nevada Range as far north as Lake Tahoe. Through almost twenty years of shunpiking (driving the back roads) we've discovered many scenic boondocking options where we camp for free. Millions of RVers who prefer boondocking in the desert flock to RV communities in Southern California and Arizona called Long Term Visitor Areas (LTVAs). They're great - especially if all you want is to live cheaply in good weather. The guide covers some of these but many RVers have discovered them so they tend to be crowded in peak season. If you prefer to camp for free in the most scenic locations, prefer traveling around rather than staying in one place, and are looking for affordable adventures and variety in your RV travels, you need this guide. It takes you on a most affordable and adventurous trip including areas of eastern California that many typical Snowbirds never visit. This guide is not just for RVers. All but 6 of the 142 suggested frugal and "camp for free" areas listed in this guide are suitable for tents as well as RVs. A complete camping accessibility index will tell you whether a tent can be set up at each campsite. The same index tells you what size of RV can most easily access the sites. Detailed directions to every suggested attraction and campsite including GPS coordinates. A route map provides a visual image of the routes and the least expensive (often free) camping locations along each one. It will help you plan the best route for the time of year you're traveling. Easy Referencing: The book is divided into three color-coded sections corresponding to the three different geographical areas shown on the map. A full index is also provided at the back of the book. A detailed 2-week itinerary for each section in the guide covers the most popular destinations on the route. Follow it to tour amazing new areas and spend less than $70.00 on camping in each two-week period. A Camping Accessibility Index: This quick reference for all 142 suggested camping areas listed in the guide shows whether a tent can be set up and what size of RV can easily access each site. Bruce and I are in California right now following your California guide. We love them all!! We have gone places and seen things we never would have if it weren't for your guides. We have been able to spend the last three winters down south because of your e-books. We can't tell you enough how we have loved and used them. Keep up your super work. Hi - we used your CA Desert & E.Sierra ebook and liked it so much we bought Coast & W.Sierra also. We bought the Eastern Sierras guide last week since we headed south from Tahoe on our way down the eastern Sierras eventually to San Diego and it paid for itself the first night. Your favorite spot on the southern shore of Mono Lake was FANTASTIC. After that we stayed at your spot on 168 on the way up to Bristlecone, again a primo location, even for our 41’ foot rig with a toad. Feel free to quote us. We've saved huge amounts of time by using your guides already.